Best of Luck is a 5-reel, 20-line video slot developed by Rival, featuring wild symbols, scatter symbols, free spins and multiple bonus games. 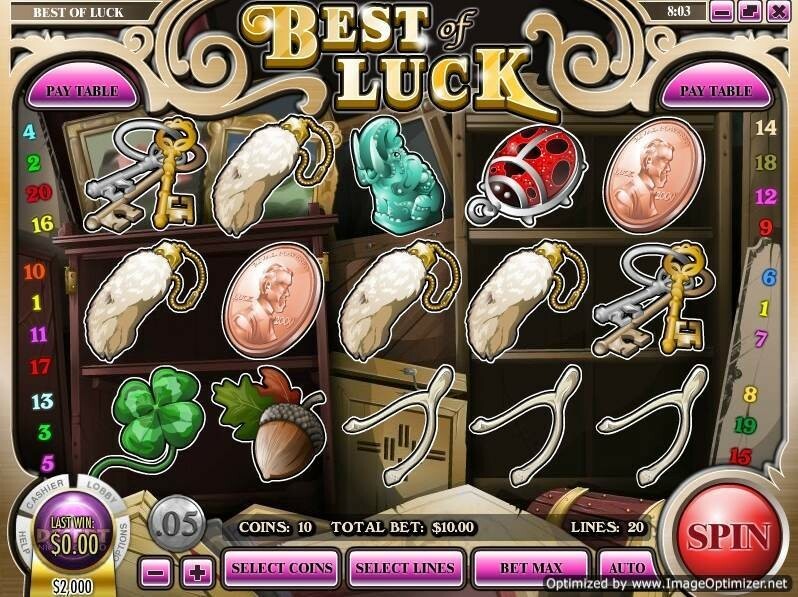 The theme of the Best of Luck video slot is different symbols of luck, or lucky charms. The various symbols include: Horseshoe, Ladybug Keychain, Penny, Keys, Four-Leaf Clover, Rabbit’s Foot, Acorn, Wishbone, Bag of Gems (scatter symbol), Kitten Statue (wild symbol) and more. Playing the Best of Luck Rival video slot is easy. All you have to do is select your coin size ($0.01, $0.05, $0.10 or $0.25), the number of coins you wish to bet per line (up to 10) and the number of active paylines you wish to play (up to 20). The minimum total bet you can make on the Best of Luck slot game is $0.01 with the highest total bet you can make being $50 per spin. To play all 20 paylines at 10 coins per line, use the “Bet Max” button. Otherwise, hit the big red “Spin” button at the bottom right. There is an autoplay option available for real money players. To win the 10,000 coin top jackpot on the Best of Luck video slot, you must have 5 Kitten symbols appear on an active payline. The Kitten symbol is wild and will substitute for all other symbols in the slot game except for the scatter symbol.